1.) Is my Pro Shop the main draw in producing new customers and members? 2.) Does it create its own advertising (no cost to the course owner) for generating new leagues, tournaments, members, and overall traffic? 3.) Does it create a powerful first impression for my new customers? 4.) Does it offer competitive pricing for my current members? So many golf course owners have had to cut corners over the past few years with the struggling economy. Merchandising your Pro Shop does not have to be one of them. Now that you have asked yourself some valid questions, let us explain how we can help you and your golf course. It has been our experience that every shop has a different identity. Some merchandise simply sells better in one location than it does in another location. So, we will interview you and some of your patrons to see what kind of inventory we need to carry in your particular location. Once we have done that, we will open an independent Steve’s World of Golf Pro Shop at your golf course. We will remain a separate identity from your facility (will explain to course owners in private). We will then stock $40,000 – $100,000 of current, inline, name-brand merchandise (balls, tees, clubs, shoes, shirts, and hats) with no cost to the course owner. Our merchandise is the most competitively priced you will see. The whole idea is to bring people back to shopping at their local pro shops, not with the big chains and the internet. The only way to keep the golf industry alive is to have golf courses to play. One main way to keep the courses open is to bring people back to shop there. Now you’re probably asking, do I have to let my current staff go? The answer is “NO”. You keep your current operation the same. The only difference is that your staff does not have to worry about dealing with sales reps. They do not have to keep track of all the rebates and markdowns that these companies have us all go through. Once your staff does not have to deal with all of theoe headaches, it will allow them to increase your business by generating more rounds of golf, memberships, league play, etc. We have developed a simple inventory system. You might be thinking, “Are there going to be UPS or FedEx shipments to my facility?” The answer is once again “NO”. All merchandise is shipped into our 4,000 sq. ft. 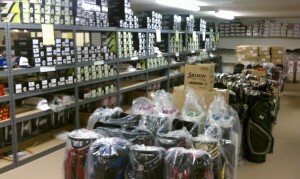 Pro Shop/Warehouse. We then put the correct merchandise in the corresponding outgoing area, and we hand deliver and work up all the merchandise ourselves. Your staff only has to work with us once a week, about four hours a month. Once your employee agrees to the delivery, we merchandise it into your shop. Here is the most important part. How much does it cost you and how much can you make? The best part is we do all of this with no cost to you. Seriously, ZERO COST TO YOU. Every sale will go through your register at your golf course. We have been able to make each golf course owner 20% net profit. In today’s traditional Pro Shops, most golf course owners are lucky to make 9% net profit. Please do not confuse NET profit with GROSS profit. Net profit is actual profit after all expenses and wages are considered. Let’s not forget that 100% of all business that we bring in or help you keep is completely yours. The absolute #1 thing that all golf course owners love about us is that they only pay us for merchandise that has been sold through their cash register. We pay all the vendors for the remaining inventory that is in our Pro Shop at your golf course. This partnership is a win/win for both parties. It goes back to what I call being paid on productivity. If we do a poor job for you then we do not deserve to be paid. Yes, it is that simple. Only pay us once a month for only the merchandise sold through your register. With my 22 years of experience owning a golf store chain, I am your best foot moving forward.